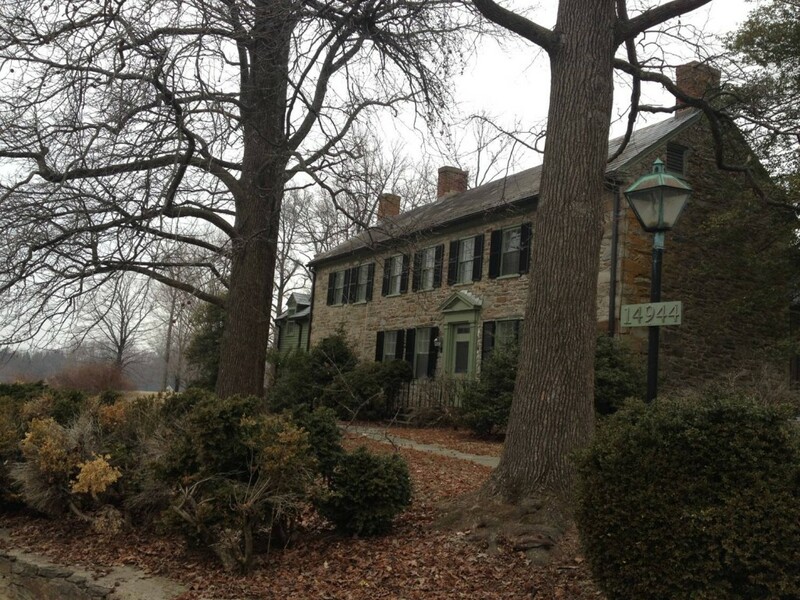 A tree-lined lane off of Roxbury Road in Western Howard County leads to Meriwether Farm, historically referenced to asMeriweather Farm, a stately stone house built in the early 1800’s on a 400 acre farm near the early crossroads community of Glenwood. The house is a two-story, seven-bay by one-bay, rubble stone home with a gable slate roof. his son, Joshua, living on an adjacent farm, inherited the property. It is not certain whether Joshua ever lived there. He sold the land in 1801 to his cousin Sarah, the daughter of Thomas Beale Dorsey, for the sum of £ 2000. She had moved from Virginia to Maryland after the death of her husband, Reuben Meriweather, to be close to her family. There is a date stone, “HM 1805,” on the gable end of the house that would suggest she had the house built and would have given it the name, Meriweather Farm. Sarah only lived in the house for a short time until her death in 1809. Her will stipulated that the land was to be sold and the proceeds shared by her children. The two sons-in-law arranged for the sale of the property according to her will. Samuel Owings, living on an adjacent farm, bought the land, house and outbuildings for $9,159.00. The house later came into the possession of his son, Samuel T Owings. During his ownership, the land was farmed with tobacco and an assessment identified a new tobacco house. He died in 1865 leaving the property to his three sons. Two of the sons sold their share of the farm to their brother, Joshua in 1865 for Five Thousand Five Hundred ($5,500.00) Dollars. Three years later, Joshua sold Meriweather Farm to Stephen Boone Dorsey, who had married Sally Elizabeth Owings, the niece of Samuel T. Owings. Stephen lived close by and farmed the property, Duvall Range. Stephen’s son Joshua received 82 ½ acres including the house and outbuildings when his father died in 1872. He added additional land and built a new cow stable before selling the farm, in 1899, to Humphrey Dorsey Wolfe who was living on a farm close by in Glenwood and a nephew of Stephen Boone Dorsey. The ownership of Meriweather Farm by Dorsey families ended in 1917 when it was sold to Wallace J. Clark. As a result of financial difficulties, the ownership of Meriweather Farm changed hands frequently during the 1920’s and 30’s and was sold off in separate parcels. In 1931, the house with approximately 123 acres was auctioned off and purchased by the New York Life Insurance Company for Seven Thousand ($7,000.00) Dollars. In 1940, Leo and Celia Butler purchased Meriweather Farm with its surrounding 123 acres from Bertrand Bratney. Over the next 11 years, the Butlers began to re-acquire the parcels of land that were sold off over the years. By 1951, the farm had grown to include 328 acres. On February 3, 1950, a fire broke out which destroyed most of the interior rooms of the house, left standing was the original staircase and front walls. The house was restored and rebuilt by the Butler family. Frances Butler Devlin is the current owner. Today, the house sits on 110 acres and is currently for sale.